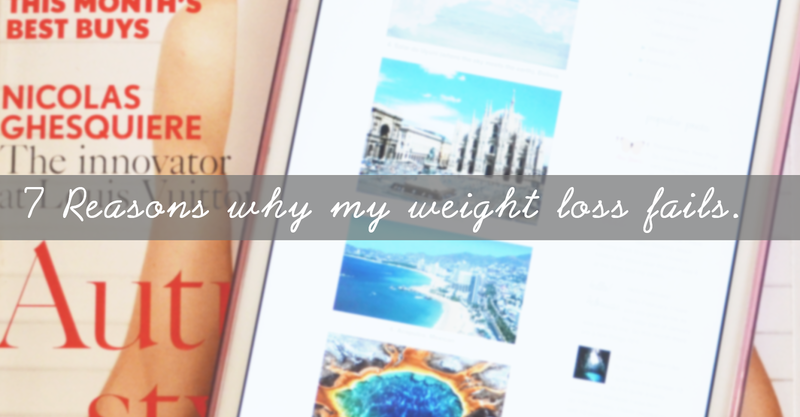 7 Reasons why my weight loss fails. Off topic* so I have been thinking about what I want my blog to contain and I have decided to keep it real personal. As, I am not much of a beauty or fashion blogger even though, I'm obsessed with beauty/fashion and the products associated with it. Whilst I have friends and they also are trying to lose weight. We have different goals and thus this can cause tension, which is not ideal when you are trying to eat out or when you are trying to decide which exercise to do together at the gym/home. Hence, I end up going to the gym on my own at maybe 1am when there is no one there as it is a 24hr gym, and don’t stay as long. I always used to watch the biggest loser back when it was really big on TV. People would lose so much weight then get stuck at one point. I think I am also stuck, I would like to lose 5kg (11lbs) which is not a lot but that is the problem. I do like my wine, usually red, but as we all know alcohol is weight-loss' archenemy. So in efforts to not give up the booze, I have cut down to just two to four glasses of red wine on a night out. Each small glass depending on the brand is about 80kcal in comprise to beer/cider which are approximately 200kcal. It's all well and good eating properly, but the exercise is what catches me out as I tend to procrastinate. Though, recently just decided to do weights only because pure cardio is a waste of time if you don't have much to lose. It's still a really huge debate about what is 'healthy'. Nevertheless, I have cut out carbohydrates such as rice, pasta, bread and potatoes, great! Then I tend to overdo it with green beans, salads and 'lean' meat...not so great, complete overcorrection I know. I know there's a buzz about a fat gene and people using it as an excuse. But, I have noticed that most women in my family have a bit of a tummy, and the area I want to lose is the tummy. In fact my mother has been on countless of diets trying to lose the tummy, and weight comes off everywhere else but the tummy. It’s not rocket science, and it can’t be attributed to environmental factors that we may all be exposed to, because we all live in different areas of the world. This one is particularly frustrating for a number of reasons. Firstly, I am actually pretty small and I dress well enough to cover up the spare tire (or wine belly) and so people don’t understand why I am obsessive about counting calories. Secondly, a lot of people these days think they are all weight-loss or fitness experts. Lastly, comments from people who are already stick thin or people who insist they are only big boned; whilst I have no problem with the appearance of both extremes. I do have a problem with the health issues that come with the two extremes. It's frustrating but all I can do is keep going at it and have patience. Is anyone else having any weight issues? Thanks for sharing your experience! I do not have weight issues but when I lose a few pounds I always get them back a few months later... My appetite changes a lot depending on the month of the year. Just stumbled across your blog and this post really caught my eye (maybe because I'v just recently started back up on my health and fitness craz). Everything you said is very honest and really shows your experiences and I appreciate that. Anyway, great post and really great blog. I'm glad I found it !